A new 20,000 sq ft builders merchant, pre-let to MKM Building Supplies and a trade park extending to approximately 23,000 sqft. Pre lets have been secured to Sixt Car Rentals and Just Tyres. The scheme is located on the established Rooksley Employment Area, which also accommodates B&Q and the Central Retail Park. The trade units can be used for B1 c, B2 & B8. The layout plan shows MKM and the trade park arranged in 5 units sharing 50 car parking spaces. The units will have an eaves height of 6m and double height glazed frontages. 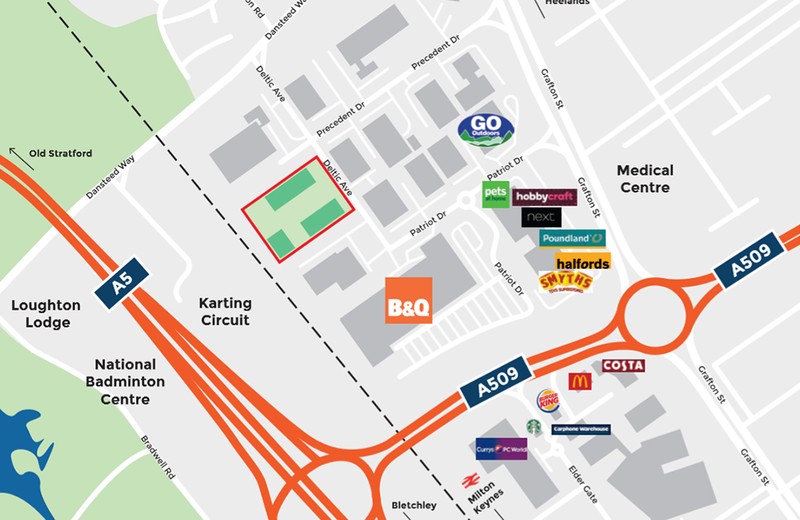 The site fronts Deltic Avenue on the Rooksley Employment Area, which is located north west of Central Milton Keynes with access from V6 Grafton street and H4 Dansteed Way. Milton Keynes railway station is less than 1 miles from the scheme.